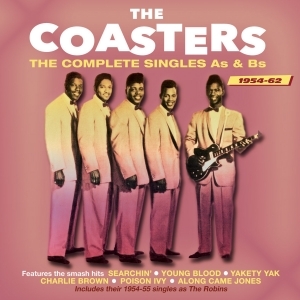 The Coasters were one of the vocal groups of the ‘50s and early ‘60s who bridged the gap between the doowop and R&B eras of the early ‘50s through to the rock ‘n’ roll explosion and beyond, with a run of hits that extended into the 1960s. They began life as a spin-off from the doowop group The Robins, adopted by the up-and-coming songwriting and production team of Jerry Leiber and Mike Stoller as a vehicle for their work, changing their name after their first hit from The Robins to The Coasters as they switched from Leiber & Stoller’s Spark label to the Atlantic subsidiary Atco when the duo signed a production deal with the label. This great-value 56-track 2-CD set comprises all their A &B sides as The Robins and The Coasters from their Spark debut in 1954 through to 1962, plus, as a bonus, the two titles which appeared on their albums during the period and were not otherwise released on singles. It naturally features their eighteen chart entries from the period, including the legendary US and UK hits “Searchin’”, “Yakety Yak”, Charlie Brown” and “Poison Ivy”, plus other memorable US successes like “Smokey Joe’s Café”, “Down In Mexico”, “Youngblood”, “Hog For You Baby”, “Along Came Jones” and “Little Egypt”. It’s not only a hugely entertaining slice of R&B-flavoured rock ‘n’ roll, with hits that were landmarks along the rite of passage for many baby-boomers, but a testimony to the songwriting and production genius of Leiber and Stoller, their humorous ‘street saga’ songs providing the biggest of the group’s hits.